Let’s say you’re a typical brand – you’ve got retail stores, tens of thousands of inventory points to track, and multiple point of sale (POS) systems. You rely on nightly batch jobs to move your POS data into your retail, store inventory, as well as incoming transfers, many other data points into your replenishment engine, run some calculations, and push the data back into your ERP system or merchandising system. Unfortunately, these systems are all disconnected, held together by complex and fragile integrations that could break at any time. And not doing any of these steps is simply not an option — getting replenishment right is critical to sustaining any brand with retail. While there are many retail replenishment systems out there, most exist outside of your ERP/merchandising systems and require expensive integrations and ongoing maintenance. Which isn't ideal, since the hard part of retail replenishment, the inventory management, is so intrinsically connected to those systems. But what if you could manage your retail replenishment directly in your core business application? This would eliminate much of the expense of implementing another solution and would significantly decrease the number of integrations. Well, if you have Microsoft Dynamics 365, you can! 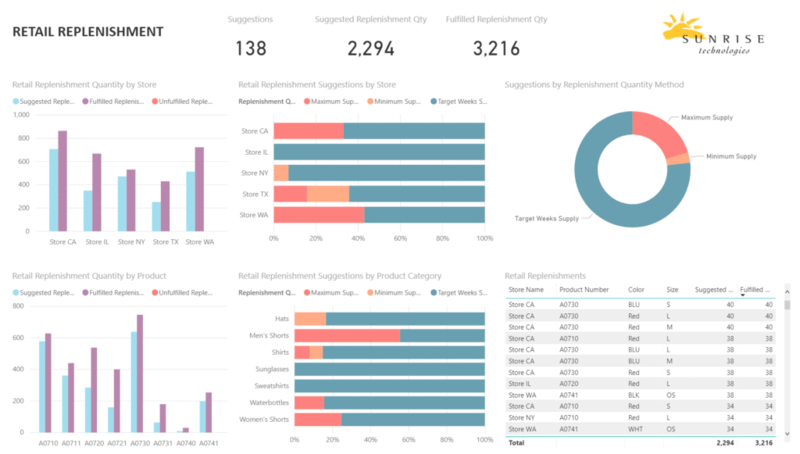 Best of all, the results of your replenishment calculations are published via Power BI dashboards. Take a look at some of these examples. The replenishment dashboard gives you a bird's eye view of replenishment quantities by store and product. It can also offer replenishment suggestions by and offers suggestions for both as well. 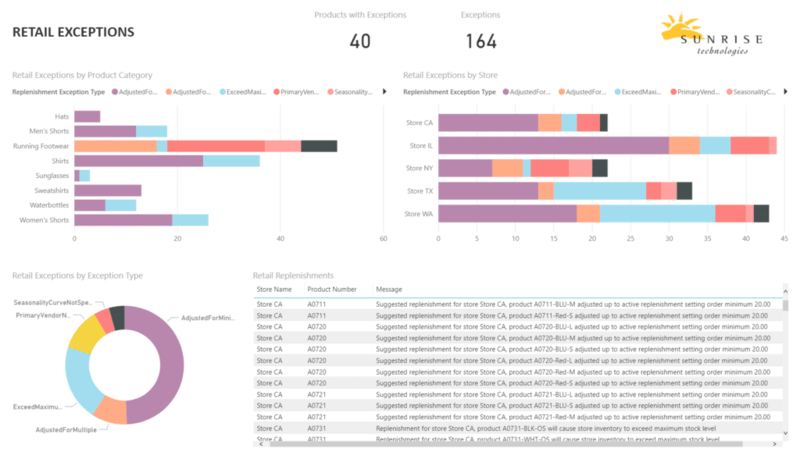 The exceptions dashboard tells you at a glance which product categories or which stores have the most exceptions and which categories those exceptions fall under. As a retailer, it's a given that you're doing retail replenishment. Why go through the extra pain, effort, and expense of integrating a third-party system to Dynamics 365, when you can have everything you need built-in, at a fraction of the cost? If you're interested in seeing Sunrise 365 Retail Replenishment in action, you can sign up for one of our retail-focused demos. Plus, check out these other resources especially for retailers. As a Microsoft Retail Partner of the Year, we get it. Retail is its own beast, with unique challenges and requirements. Check out some of these other resources we've put together, just for retailers.